When Anchor Brewing Company first brewed a wheat beer in 1984, it was the first time that a wheat beer had been produced in America since Prohibition. Before Prohibition, during the late 19th and early 20th centuries, several styles of wheat beer were being produced by the largely immigrant German brewing industry that flourished during that time. 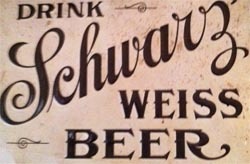 Promotional sign for an early weiss beer, found in the attic of an 1890’s era store on Market street in San Francisco. Variously known as “Weizenbier” (wheat beer) or Weisse (white), wheat beers were never very popular outside of the German community with which they were associated. By the end of World War I, with anti-German sentiment lingering, the style had slipped into obscurity. Prohibition, enacted shortly thereafter, virtually finished it. The repeal of Prohibition in 1933 brought brewing in America back, but the prevalent beers were Pilsner-style lagers. Wheat beer in America had been forgotten. Curiously enough, it was another war that helped remind Americans of their existence. America was drawn into World War II on December 7, 1941, just eight years and two days after the repeal of Prohibition on December 5, 1933. The historical events which ensued brought the American Army into Germany where they stayed, due to the Cold War, for the next forty years. With two or three generations of young American men based in Germany for a year or so, it was only natural that there was a degree of cross-cultural exposure to the local beer. Returning G.I.s, many of whom were rediscovering their German heritage, increased the demand for imported German beer styles (wheat beer among them). Despite this interest, it wouldn’t be until 1984 that a wheat beer would be produced domestically. As the first American wheat beer in modern times, Anchor Summer® Wheat introduced the country to the clean, crisp flavors of a filtered wheat beer. 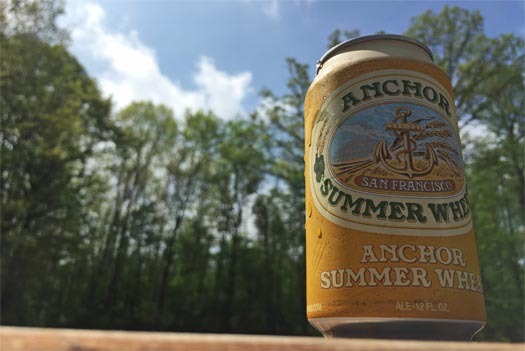 Anchor Summer Wheat is the prototypical example of the style that is now described as “American Wheat Beer.” American Wheat Beers can either be filtered like Anchor Summer Wheat, or may contain some yeast and be hazy like a Hefeweizen. They are yellow to gold in color. Most contain a high proportion of wheat malt, typically 50% or more, the remainder being malted barley. The yeast in American Wheat is usually a clean ale yeast but also can be a lager strain, and does not give the beer the banana/clove character found in a classic German Hefeweizen. American hops are used sparingly, and sometimes give a spiciness not found in German varieties. Anchor Summer Wheat is dry-hopped with Golding and Simcoe hops, giving the beer a nice, mild hoppy aroma that compliments its crisp, clean finish. Best characterized by a thick white head and a crisp, slightly grainy finish, American Wheat is a perfect, refreshing summer beer style that does not need to be served with a slice of lemon. Almost exclusively the province of today’s craft brewers, the style continues to evolve with many variations – darker malts being used to give the beer more color, rye malt being introduced for flavor, and various combinations of hops giving more complex aromatic and bittering characteristics. American Wheats have even been used as a base for fruit beers such as raspberry, apricot, cherry, and even watermelon. With the calendar turning to May, summer is just around the corner. We invite you to celebrate with an Anchor Summer Wheat, and Raise Your Anchor to summer! 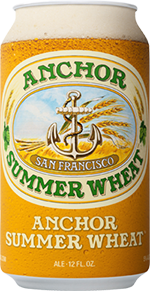 Use our Beer Finder to search for Anchor Summer Wheat and other Anchor brews near you. This post was updated May 20, 2016.